bl.uk > Online Gallery Home	> Online exhibitions	> Asia, Pacific and Africa Collections	> Dosadh (syce), Eastern Bengal. 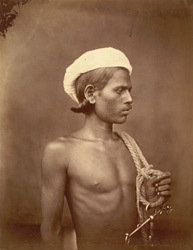 Portrait of a Dosadh 'syce' or groom taken by an unknown photographer in the early 1860s. The aboriginal Dosadh tribe were traditionally associated with Bihar though some families lived in Dacca during the nineteenth century. They were employed as house bearers, syces, coolies and porters. Their patron was the Hindu demon Rahu although they also worshipped deified heroic members of the tribe outside of the Hindu pantheon. During the latter part of the century the British Government sought to acquire information about the diverse races, customs, costumes and occupations of the sub-continent. The rising science of ethnology created a demand among European audiences for ‘exotic’ souvenirs of the East. This print is from a collection which features groups and individuals from across Eastern Bengal (modern Bangladesh and Assam), however the photographs were taken in and around the same temporary studio built onto the side of a European house.